I'm confused because my current cartridges are HP 28 colour and HP 56 black. There seems to be an alternative HP No. 57 colour cartridge which is better value. Will that work in my printer? Yes, all of the cartridges listed on this page are guaranteed to work in the HP Officejet 4215 printer. The HP 57 high capacity tri-colour ink cartridge works in the same way as the HP 28 tri-colour ink cartridge except it contains more ink and delivers a cheaper cost-per-print. As long as you have one black and one tri-colour cartridge installed you can choose any of the different capacities available for each colour which will all have different cartridge numbers. Please be aware that the HP 58 photo colour cartridge is only optional and can work in the black cartridge slot for photo printing. When it comes to printing at home or in the office, it's difficult to beat the HP 4215. Sooner or later your HP 4215 will gobble up all of your printer ink, and then you'll soon learn that new HP 4215 ink is generally quite pricey. Thank goodness you have no reason to get worried about coughing up the steep fees you'll find on the main street because now at Cartridge Save you can get all the HP 4215 cartridges you will ever need at ultra low prices. Start to save money on your ink by buying online at Cartridge Save! Why spend so much on the 4215 original cartridge or 4215 compatible ink on the main street when it is far more straight forward to save some cash ordering online with Cartridge Save. You enjoy perfect confidence when purchasing Officejet 4215 ink cartridges from us as everything is protected by a no quibbles money back guarantee. Don't forget that each order also comes with free delivery, usually delivered to your door the next business day! The HP Officejet 4215 integrates copying, faxing, scanning, and printing into a standalone compact inkjet device. Aimed at small office users that need basic scan, copy, and fax features, it boasts good quality output and a versatile paper feeder. However, HP needs to do something with the speed and the paper feeder's design, which doesn't seem to work with thicker paper. This inkjet printer features a sheet-fed scanner, fax machine, and a copier. In draft mode, it is capable of producing as many as 17 ppm in monochrome. The maximum resolution is 1200x4800 (optimised), while fax machine runs efficiently and fast with its 33.6 Kbps modem. The entire device weighs 8.4 lbs. When the paper trays are not in use, the HP Officejet 4215 measures 8 inches and 7.1 inches tall. Being a compact machine at 16.4 inches wide, the HP Officejet 4215 doesn't make your desk look cramped. The 8MB RAM is just right for its size and for performing basic functions, which it is meant to do. 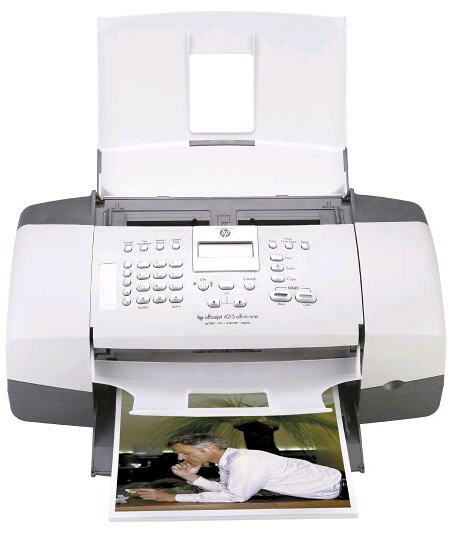 The fax machine's total memory capacity is up to 100 pages; it is integrated with additional features like fax forwarding and automatic redialling. One of the main drawbacks of the HP Officejet 4215 is the scanner, which is sub-par to flatbed scanners because it limits the type of media you can scan. The HP Officejet 4215 is unable to handle thick paper (i.e. photo paper, glossy paper, etc.) or scan content from books and magazines, for example. Computers running on Windows Vista and Windows 7 may experience compatibility issues with the 4215. Overall, the speed is also relatively slow.